We're using the lab next door's Bioscreen incubator to generate growth curves for our H. influenzae competence mutants. 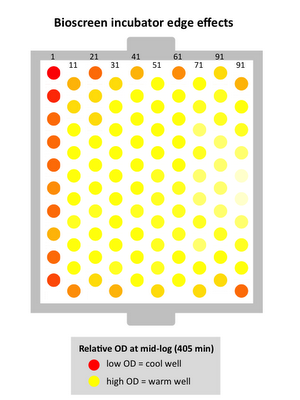 This machine collects optical density (OD) data from cultures growing in wells in special 100-well plates; you can control the temperature and the shaking parameters and the frequency of the OD readings. I used it a few months ago for my GFAJ-1 analysis, but now we're using it to see if any of our knockout mutants have altered growth properties. That would be interesting because it would suggest that the missing protein does something useful for the cell outside of competence, and might help us understand why some proteins in the competence regulon don't play any role in DNA uptake. I first did two controls. The first one was to compare H. influenzae cultures started in several different ways - from fresh and day-old colonies, and at various dilutions, and to see how close the growth of replicate cultures is. I used 10 replicate wells for each culture condition, and the results were excellent - all of the growth curves could be superimposed, with enough resolution to even see a tiny 'diauxic' pause in the growth, where the cells were switching from an exhausted nutrient to one they hadn't used yet. The second control really should have been done first - a test for 'edge effects' and other inconsistencies in growth between the different wells in the culture plate. I was concerned that different wells might experience slightly different growth conditions (temperature, oxygen, whatever). In my previous test I had semi-randomized the arrangement of the different cultures in the wells, to average out any effects. For this test I put aliquots of the same culture in all the wells. The results were worse than I'd expected. 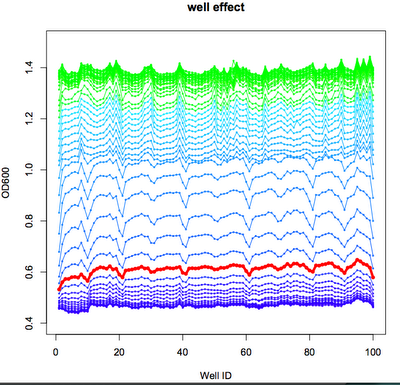 First, here's the superimposed growth curves from all 100 wells in this experiment. The X-axis is time and the Y-axis is OD. Although we don't see any growth for the first 300 minutes, the cells are growing, but their density is so low that they don't cause detectable changes in the OD readings. Again we see the little diauxic pause, here at OD = 1.05. The cultures peak with a tiny growth spurt at OD 1.4 and then the OD slowly declines. But here's what was going on in the individual wells. Each line in the graph below is the readings at one time point; if all the cultures were growing identically it would be a flat line. Instead we see regular rises and dips with a 10-well period, showing that cultures in some of the edge wells are growing slower than those in the internal wells. 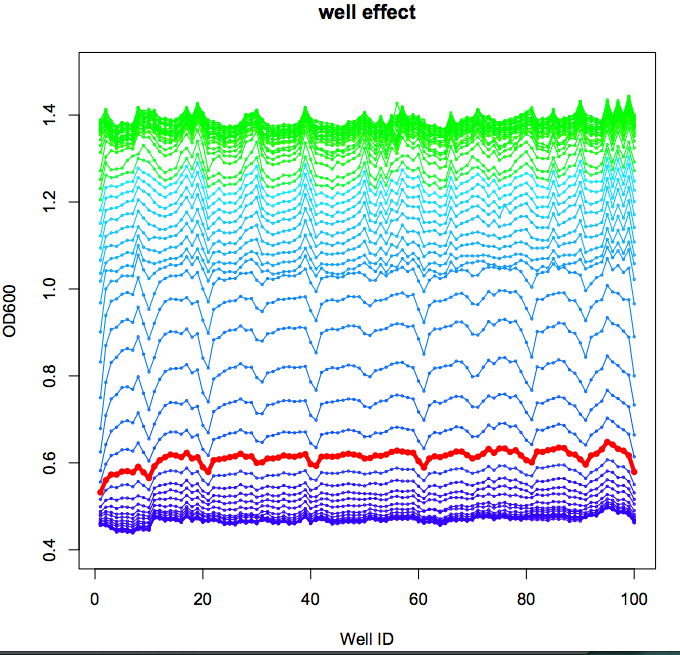 I don't know why we also see peaks in the green lines at the top - these suggest that some wells' cultures grow to a higher final density. I don't think this is due to slightly different volumes in different wells. If so it should go away if I subtract off the initial reading for each well. A look at the innards of the Bioscreen suggests that these wells are probably a bit cooler than the others. The postdoc used his R awesomeness to make a heatmap showing the differences in growth rates for the time point indicated by the red line above, and I massaged it onto the schematic of the well layout, shown below. The wells on the right side aren't cooler, because the tray that holds the plates has space for a second tray on that side. So now I'm doing 8 replicate runs for each of the competence mutants, and I'm using the wells that are orange or red in the heat map as control wells, putting plain medium with no cells into them. So far the results are very boring - all the mutants grow at the same rate.